Distributions of many variables of interest in developed economic and financial markets, including income and wealth, exhibit heavy tails as in the case of Pareto or power laws. Many commonly used income and wealth inequality measures are very sensitive to extremes and outliers generated by these distributions due to their heavy-tailedness properties. 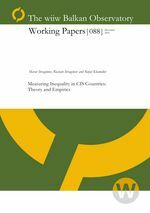 This paper focuses on robust analysis of distributions and heavy-tailedness characteristics for data on income and wealth for the World, Russia and post-Soviet Central Asian economies. Among other results, it provides robust estimates of heavy-tailedness parameters for income and wealth in the markets considered and their comparisons with the benchmark values that are well-established for distributions of these variables in developed economies. The paper further provides applications of the obtained empirical results to inference on inequality measures and discusses their implications for market demand and economic equilibrium.